I was doing my typical evening browsing of the New York Times website, catching up on Paul Krugman’s latest rant about the financial crisis when I noticed a large Toyota ad telling me, “We See Ways to Enrich the Community.” So I did what apparently only 16% of the online population does, I clicked through the advertisement. The ad led to Toyota’s Beyond Cars website which features a new brand campaign showcasing how Toyota is a company not only interested in building customers bland, reliable cars. No Toyota is all about making a positive difference in the environment, economy, and communities we all live in. Site visitors are asked to share how they “see beyond today to a better tomorrow” after being told that Toyota has built over 1 million hybrid vehicles. The “Beyond Cars” campaign commercials talk about urban gardening and about Toyota’s program to educate teens to be safer drivers. It’s your typical good corporate citizenship videos that could’ve been done by any Fortune 500 company. Some additional posts by the company mention other charitable activities by the company. All of this is typical corporate responsibility marketing. There is nothing really that compelling or memorable about it. Nor is there any communication about Toyota products so it is true to its message; it’s definitely beyond talking cars. User engagement is typical when there is little to no consumer benefit to share. Visitors to the site shared 29 photos, 2 videos and 22 written comments when I looked a week after finding the site. Since there is no incentive to share content, the content submission numbers are inline with similar examples I’ve seen. It’s also quite clear from reading most of the comments from visitors, assuming most are not from Toyota employees or the marketing agency staff, that people are sharing ways to impact the environment. Perhaps most of the media buy is targeting green-minded consumers. Of course all of the content is monitored by Toyota so perhaps they are keeping comments from visitors to the intent of the site. The odd thing is that the interface borrows from the Facebook interface, allowing visitors to “Like” ideas or submit a post to the wall. I wonder why they didn’t bring this implementation into a social community like Facebook instead of creating a custom website. Seems to me the ideas could’ve spread more easily through an interface that provides the behaviors the Toyota site is trying to replicate. 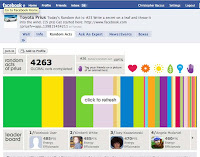 People earn points by accepting and passing on a random act. Acts include “skip once today instead of walking”; “refrain from sad emoticons today, use only smileys”; and “write a poem and put it on the fridge.” I wonder if I can earn my points if I just post William Carlos Williams “This is just to say” to my fridge? The real question is who came up with these acts and more importantly why would I share it in my social network? Plus I’m not sure how any of this relates back to the Prius. The one thing that is well done on the application is that it does attempt to be conversational and give Facebook users a way to engage within their network in a method that is natural to the community. And while I may not get the humor in the acts, some others may find the odd acts as a fun way to pass on unusual content. The application does miss on communicating out to one’s news feed on Facebook. It never asks me to “Publish” anything I do. So that leaves all communications limited to whoever the user selects to send an act to, meanwhile no other friends see the activity and the application loses exposure to the rest of that person's network. 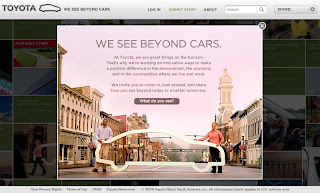 It’s unclear whether the Prius Facebook application and the Beyond Cars site are related. It is clear that both implementations have nothing to do with cars.